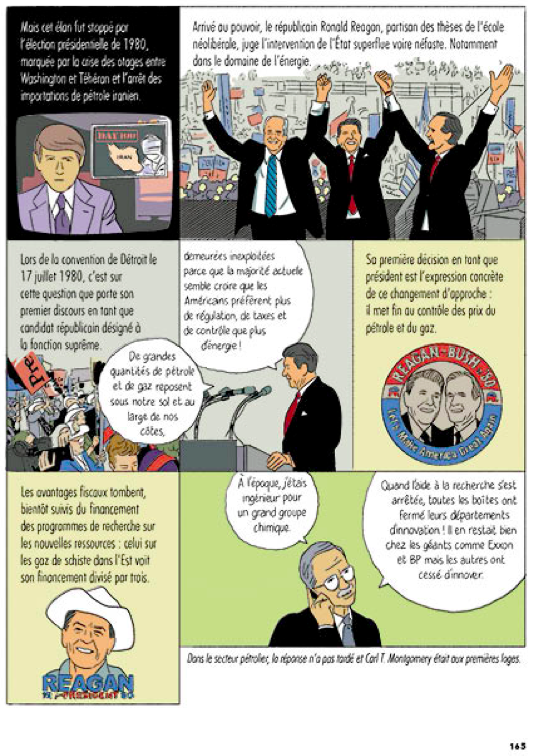 A new, 228-page bookazine launched this month in France in the form of a collection of comics focused on current events. Similar to the successful Revue XXI, a bookazine that incorporates long form investigative articles and comics related to a newsworthy theme, La Revue Dessinée, a play on words from Bande Dessinée (BD), or comic strip, is produced both on paper and in ebook, enriched media form every three months. The first issue includes an investigation into fracking and other forms of “extreme” energy, a look at an immigrant neighborhood in Brussels, the tale of a young farmer up against corruption, and profiles of sailors who work on the French navy ship, the Floréal. The bookazine was initially conceived to be purely digital. The founders said it was difficult to come up with an economic model for just a digital version, but the paper and digital model worked, with crowdfunding providing the bulk of the budget—82% of La Revue Dessinée is owned by the founders—and the rest of the funding was met by several investors, including Futuropolis, a graphic novel imprint owned by Gallimard. Sold digitally for €3.59 in the Apple Store and in print in bookshops in paper for €15, La Revue Dessinée already has 1,000 subscribers so far and hopes to gain 4,000 more this year.